This page features earrings that dangle from an earwire without a back, also known as a french wire. This style is highly comfortable for pierced ears, one-piece ease of taking it on and off, easier for ladies on the phone. Non-tarnish brass wire is beaded with brown, periwinkle and golden beads and crystals, suspended below a 6mm rondelle of SAPPHIRE in lavender-blue color. 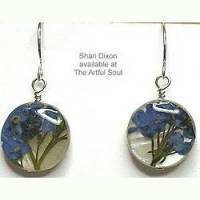 Earrings are 1-1/8 inch across, 3-1/8 inches long on goldfill earwire. 5/8 inch handmade porcelain bead is wrapped with silver wire and suspended from earwire, 1-3/8 inches long. The bead colors and finish may vary a little, these are turquoise blue-to-green. The polymer clay ellyptical beads are about 1-1/2 inches long, suspended from self-locking goldfill earwire to dangle 2 inches. The colors are salmon and coral pink, gray and metallic gold. Orbicular patterns are revealed in translucent and opaque, rubbed to satin finish. From the manual typewriters you learned on (or perhaps your grandmother did), black faces with ivory characters ringed in silver. These are used so not in pristine shape...you enjoy the history. Each is mounted onto a silvertone metal disk, 1/2 inch across, 1-1/4 inches long on surgical earwire. Keys as shown, sorry we cannot customize. 2-1/4 inches long on goldfill earwire, 5/8 inch across. 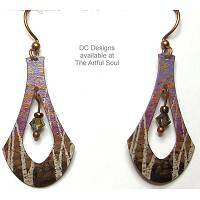 Dramatic open shapes are colored in muted purple, green and caramel with gold and silver speckling. Key-shaped drop in sterling silver dangles 1-1/2 inches long on earwire. A round piece of Ancient Roman Glass in iridescent color is set at the top. 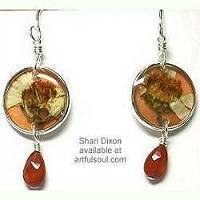 Layers of birch bark are joined with sterling wire with disks of ANCIENT ROMAN GLASS that has iridescent colors. 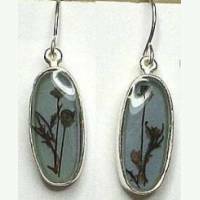 These are stunning and lightweight earrings, measuring 5/8 inch across, 2-1/8 inches long including sterling earwire. Sterling silver has been forged and hammered to resemble the Emperor's coveted bamboo twigs. 2-3/8 inches long including earwire, 1-1/4 inches across overall. Colorful beads are secured to flexible silver fabric backing, colors of turqoise and orchid purple arranged around a teal crystal. 2 inches long on elongated and tapered silver plated earwire that suits the style so nicely. 1 inch across and light in weight. A bit of men's tie fabric in a royal blue and red check weave. The fabric is mounted to a flat and slender royal blue disk, dangling below red color glass and silverplated french earwires. 2 inches long overall, 1 inch across, ultra lightweight. Simple yet striking earring in slver finish has a hollow bead with faceted angles and wide opening, suspended from short ball chain and earwire. 1-3/4 inches long, 1/2 inch across, super lightweight. About 1-1/2 inches long on french earwire, 7/8 inch across. A loop joins at the top, beaded with closely stacked 3/16 inch wide "cups" of aluminum or steel that are colored darkened copper. Lightweight and intriguing. 2-3/4 inches long on sterling earwire, about 1 inch across. These are lightweight with lots of movement, as the steel has been bent and hammered to form an open outline around stamped brass charm that dangles from iron wire. 1-1/4 inches long including sterling earwire, 1/4 inch across but staggered. Four bicone shapes are cleverly joined with square clear studded spacer to do staggering magic! The sparkling Swarovski crystal colors include topaz yellow, lavender, tourmaline green and black. Then and graceful rectangular wood earrings are 1-1/2 inches long including surgical steel earwire, and 3/16 inch across. Cut and curved from colorful wood laminate block, where each wood layer is dyed before assembling, you can see the design shift from front to back. Gorgeous and lightweight! Polymer drop is 7/8 inch across, dangles 2-1/4 inches on surgical earwire. Miniature red rose with yellow-green stem and leaves, is encapsulated in clear acrylic and silver cup. 5/16 inch across, 5/8 inch long, dangles 1-3/8 inches long on earwire. 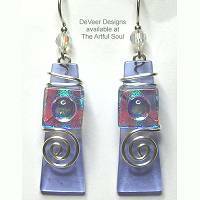 2-1/2 inches long including surgical earwire, 3/4 inch across the square fused glass element set at an angle. The fused glass pieces with dichroic include colors of turquoise blue-plum-violet and royal-ice blue. Light sapphire blue bead dangles below. 3 inches long including golden earwire, about 1/2 inch across, the wonderful odd shapes of recycled glass (tumbled like beach glass) are framed on the outside in zero-karat gold. Color combination as shown, left and right will be different! 1-7/8 inches logn including silvertone earwire, 1-3/16 inch across. Resin drop is smooth and flat with satin finish, it has a luminious shell-like quality within, a luminous rich apple green color. 2 inches long on surgical earwire, 1-1/4 inch across. Lead-free pewter dangle is a slightly domed oval shape with brushed shiny top surface, blackened in the deep recessed pattern. Bands of angular waves gracefully sweep across the piece in a motif that is both deco and classically Greek. 2-7/8 inches long, 1-1/4 inch across. Goldtone earwire with inverted teardrop that is wrapped in black cord, has beads extending outward along the bottom edge. Goldtone beads and clear crystals, this can be dressy or casual, lots to show without being weighty. 1-3/8 inches long on surgical earwires, 5/8 inch round stainless silver case has clear resin encasing the design. The artwork depicts fleur-de-lis on yellow/purple pattern with black&white border. Lightweight too! 1-1/4 inches long on sterling earwire, 5/8 inch across. The square is fused dichroic on top of black background, the color is sparkling deep teal blue with hint of emerald. 1-5/8 inches long including silver coated surgical earwires, 3/4 inch across. Teardrop convex metal shape, lightweight, glimmering white backing. The artwork depicts a snippet of graffiti in purples and pinks. You can barely make out the words "happyness can be found even in the darkest of times, if one only remembers to turn on the light". 1-3/8 inches long including sterling earwire, 1/2 inch across. Beautiful medium and navy blues of the Forget Me Knot flowers on green stems, stand out on luminous mother-of-pearl white shell background, covered in clear resin for shine and depth. Forget Me Knots symbolize true love, the human longing for lasting love and, of course, remembrance. 1-1/4 inches long including sterling earwire, 5/16 inch across. Antiqued silver plated pewter oval frame holds a dusk blue background upon which the Smoke Tree Blossom in dark pink/purple and greens stands out, covered in clear resin for shine and depth. Smoke tree gets its common name from the frothy, fluffy summertime bloom clusters. Its native range is from Tennessee to Oklahoma and south-central Texas. A long stick is formed by sterling sheet that is carefully wound downward, sporting a random dot pattern on its surface. 2.5 inches long, less than 1/8 inch wide. By The Artful Soul, this is part of a black & white geometrics polymer clay collection, with shades of gray between. 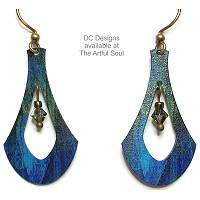 Detailed handbuilt patterns are sliced and mounted onto background clay, accented with gold leaf, then fired. Light and artful. 2-1/2 inches long on surgical earwire, tapered curve is 1 inch wide at the end. 1-7/8 inches long on sterling earwire, 3/8 inch across. Tapered column of transparent lavender glass has square fused onto it with dot that glow iridescent blue/gold. Silver wire wraps around the top and back to finish with spiral on the front. Some Dangling Style earrings, that have a shiny gold or shiny silver metal finish in their colors, and a ring or hole at the top where they attach to a separate earwire, may potentially be converted into a CLIP ON style for non-pierced ears! Instead of the earwire, we will take the dangling earring element(s) off and put onto a comfortable clip as pictured. We will match shiny gold or silver metal color, but cannot match matte, blackened, copper, or other colors. To add the conversion to your order, after you click [Order] and reach THE SHOPPING CART SCREEN, specify by item # the earring(s) you want converted, and be sure to add the charge for each one! NOT ALL EARRINGS CAN BE CONVERTED...EMAIL US AND WE CAN ANSWER YOUR INQUIRY IN ADVANCE ABOUT A PARTICULAR STYLE!